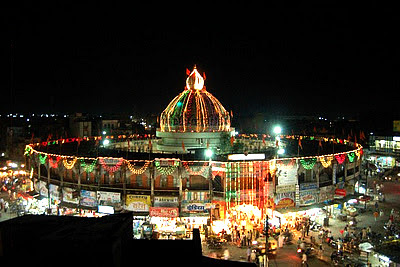 Ganj Golai is a famous round shaped building located in the heart of city Latur of Maharashtra, India. The sphere building is connected to the city through 16 roads. The double storied Ganj Golai was constructed in 1917. It is host to the temple of Goddess Jagdamba. The center of building where temple is, was built again and a new 8 ft idol was established in 1989. The place has become a major commercial and trade center of Latur because along those 16 roads originating from Ganj Golai are separate markets selling all kind of things. The 16 roads are dedicated to each type of item like shoes, spices, jaggery, gold ornaments and other traditional items and are named after items like cloth line, metal line, saraf line, gift shop line etc. Latur is a district town on the Solapur - Nanded route with rich historical importance. People visiting Latur definitely come to see this market and all the credit goes to Shri Faiyajuddin who designed the layout for Ganj golai. Jagdamba Mata temple at Ganj golai was built in Rashtrakuta's era. It is known to be a section of Tuljapur’s Tuljabhavani Temple. At Ganj golai devi temple navaratri mahostav is being celebrated every year with great fervor. During the mahostav the markets are blooming with traditional items and food specialties. As Latur is an important trade and commerce center it is connected very well to other parts of country. Mumbai is around 7 hours from Latur while Pune is around 5 hours. Once you reach Latur you can book and avail MSRTC buses to reach the circular monument of the town. There are many private buses also running in town. Taxis and auto rickshaw are available too. Other nearby sightseeing and local attractions of Latur are various temples belonging to Keshavraj, Bhuteswar, Ramlingeswar and Dutta. Surat Shahvalli's dargah and Astavinayak and Parshavanath Temples are also worth seeing in the city. All these places add to the cultural heritage of Latur.